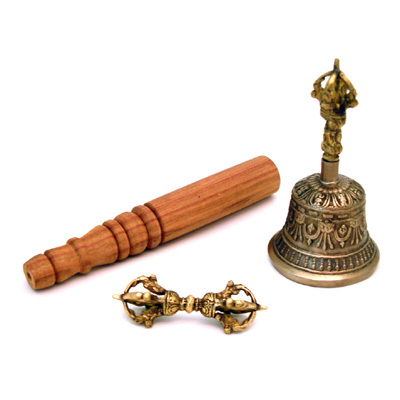 Hand made Tibetan ritual bell, complete with Dorje and stick. The bell represents wisdom and the feminine aspect of the divine, while the dorje or thunderbolt represents the creative forceful male energy. During ceremonies, the bell is held in the left hand with the dorje in the palm of your right hand. As the sound of the bell resonates, together they balance the negative with the positive to harmonize one's life and surroundings. Height: 14 cm, Diameter: 7 cm.